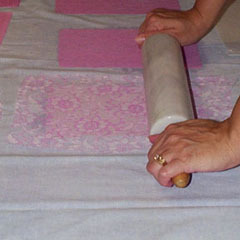 Here I am rolling a rolling pin over the lace (the wet paper is underneath) to further embed the pattern into the paper. That's it! Those are the only extra steps to make this beautiful paper!